Antarctica's ice sheets responded most strongly to the angle of Earth's tilt on its axis when the ice extends into the oceans. 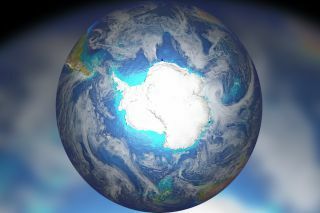 To reconstruct a history of how Antarctica's ice has responded to this tilt, Meyers and his co-authors used a few sources of information on the Earth's climate past. One source was calcium carbonate from the ocean bottom, left behind by single-celled organisms called benthic foraminifera. These organisms excrete a calcium carbonate shell around themselves, locking in a global, continuous record of the chemistry of the oceans and atmosphere. About 15 million years ago, when atmospheric carbon dioxide levels ranged from 400 to 600 ppms, Antarctica lacked sea ice (left). Today, the continent is surrounded by sea ice (right), which is threatened by climate change.